Miltank in game: 3,116 Who? Important notice! Pokemon Miltank is a fictional character of humans. 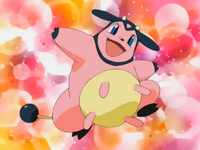 Miltank (Japanese: ミルタンク Miltank) is a Normal-type Pokémon introduced in Generation II. 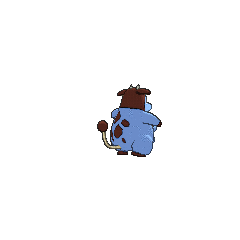 It is not known to evolve into or from any other Pokémon, but it is considered to be a counterpart of Tauros. 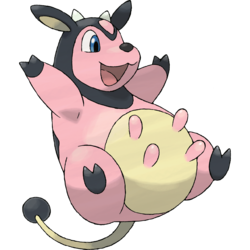 Miltank is a bipedal, bovine Pokémon, which can only be female. Its body is mostly pink, with a yellow belly and black, angular markings along its back. A black hood-like marking surrounds its face with a pink, triangular mark on its forehead. There are two small horns on top of its head. It has large, blue eyes, a black nose, and a wide mouth, as well as long, black, floppy ears with yellow insides. Miltank has a yellow udder with four pink teats. All four of its limbs end in black, cloven hooves, and its long tail is tipped with a black sphere. Until Generation VI, Miltank was the only known Pokémon that could learn Milk Drink. The milk that it produces is sweet and very nutritious, and can be used to heal Pokémon and ill or weary humans. It can produce over five gallons of milk per day, which in turn can be turned into yogurt or enjoyed unchanged by children and adults alike. 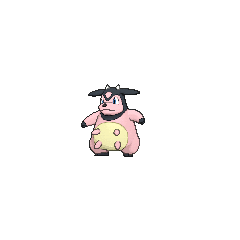 Miltank lives in grasslands, and is also raised on farms. Miltank first appeared under the ownership of Whitney during A Goldenrod Opportunity and A Dairy Tale Ending where it was used in a Gym battle against Ash's Pokémon. Whitney's uncle, Milton, also has multiple Miltank at his farm in A Dairy Tale Ending. In Got Miltank?, a Miltank was guarding an area that was for Pokémon only. Four Miltank appeared in Tanks for the Memories!. One under Autumn's ownership, nicknamed "Ilta" (ルータン Rūtan), two under Spring's and another one under Summer's. Multiple Miltank were seen at Professor Oak's Laboratory in Bulbasaur... the Ambassador!. A picture of a Miltank appeared in Hocus Pokémon. A Miltank appeared on the side of a truck in Entei at Your Own Risk. Harrison also has a Miltank, but it has only been seen using her to quell an argument between Ash's Bulbasaur and Squirtle and Vincent's Meganium and Azumarill during the Silver Conference in Tie One On!. Solana enlisted the help of a wild Miltank in Pokémon Ranger: Deoxys Crisis. Several Miltank were seen outside of a Pokémon Center in Danger, Sweet as Honey!. EP158 Miltank Ash's Pokédex Miltank, the Milk Cow Pokémon. Miltank produces very nutritious milk, a perfect drink for reviving sick Pokémon. Miltank are very even tempered and prefer not to battle. DP062 Miltank Ash's Pokédex Miltank, the Milk Cow Pokémon. It is widely known that drinking Miltank milk when you are young helps you to grow up strong and healthy. Miltank, nicknamed Mil Mil, is seen as Whitney's main Pokémon powerhouse, which she used in a bike race with Gold in Smeargle Smudge. She later took her to the Mahogany Gym with DJ Mary and her crew in Irked Igglybuff and Curmudgeonly Cleffa, and used her to fight a moving sculpture that they believed was Suicune, where she failed even with an ice floor-augmented Rollout attack, and had to team up with Pryce to win. She later uses her in the Pokémon League Gym Leader tournament against Misty, but her Starmie takes her out with ease. In the MooMoo Farm, Eusine feigns healing a Miltank in Miltank Melee, with other Miltank out in the fields. They are seen again in Indubitably Ditto, sleeping, having been affected by Parasee's Spore. In The Last Battle XIII the couple from MooMoo Farm sent multiple of their Miltank to help the fight in Ilex Forest. In An X-cuse to Come Out and Play, a Miltank is seen with her trainer as Yveltal and Xerneas destroy Vaniville Town during their battle. One of Whitney's main Pokémon in Pokémon Gold & Silver: The Golden Boys is a Miltank. Red was revealed to have a Miltank in A Finger Lickin' Battle!. Giovanni stole five Miltank during Messing up the Farm!!. Professor Oak was able to rescue them from Giovanni and takes them under his control. Whitney also has a Miltank as shown in Fierce Battle Between Clefairy and Clefable. A Miltank appeared in PMDP53 and Participate in the Pokéathlon!!. Gold, Silver, Crystal, HeartGold, and SoulSilver: The MooMoo Farm has a herd of Miltank. The Miltank that provides milk is ill until the player feeds it a certain amount of Berries. Its milk is packed with nutrition, making it the ultimate beverage for the sick or weary. If it has just had a baby, the milk it produces contains much more nutrition than usual. In order to milk a Miltank, one must have a knack for rhythmically pulling up and down on its udders. Miltank gives over five gallons of milk on a daily basis. Its sweet milk is enjoyed by children and grown-ups alike. People who can't drink milk turn it into yogurt and eat it instead. It gives over five gallons of milk daily. Its sweet milk is enjoyed by children and grown-ups alike. People who can't drink milk turn it into yogurt and eat it instead. It is said that kids who drink Miltank's milk grow up to become hearty, healthy adults. If it is around babies, the milk it produces contains much more nutrition than usual. Its milk is high in calories and packed with nutrients. Therefore, if you drink too much of it, you may wind up with a body like Miltank's. Moves marked with a superscript game abbreviation can only be bred onto Miltank in that game. 51%-100% HP My milk is full of healthy nutrients. 26%-50% HP Oh, my goodness. My health is down to half, it seems. Level up My level went up! My milk is more nutritious, too! It attacks by letting loose shock waves and thrashing around. 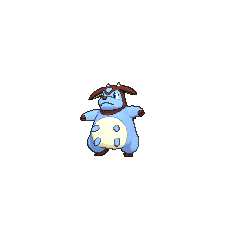 For other sprites and images, please see Miltank images on the Bulbagarden Archives. Miltank's Silver and FireRed Pokédex entries imply that Miltank gives live birth like real-world mammals, despite the fact that Pokémon reproduce via Eggs. Although Miltank is a counterpart to Tauros, it is unable to produce Tauros offspring, and its Eggs will only produce other Miltank. One must breed a Tauros with a Ditto to produce another Tauros, which will likewise never result in a Miltank. 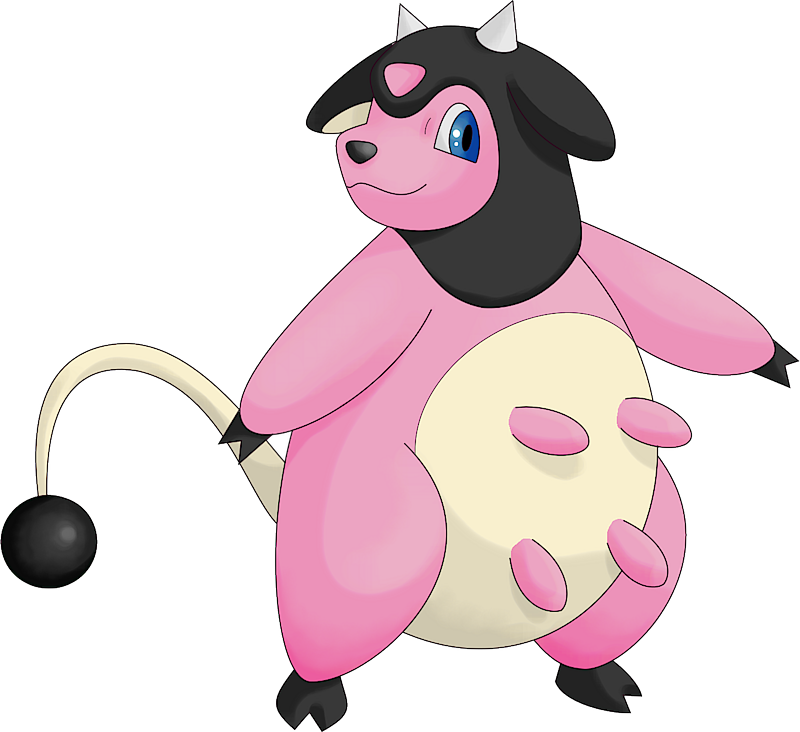 Miltank is based on dairy cows. It shares many traits with Jersey cattle and Holstein Friesian cattle. Miltank is a combination of milk and tank (a storage container for liquid). Tank may also refer to its tank-like defense stats. Mandarin Chinese 大奶罐 Dànǎiguàn Can be taken as "Big milk tank"